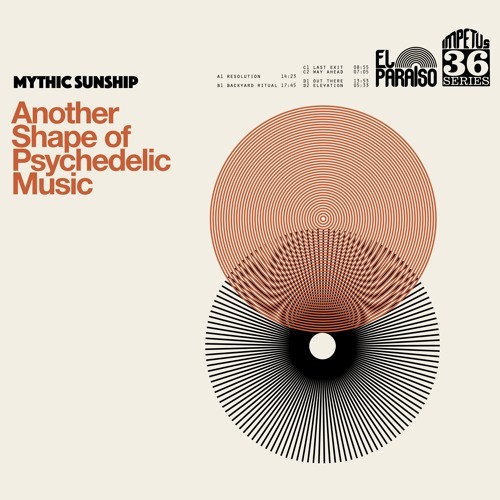 Mythic Sunship’s sound has been described as “the ethos of free jazz in a doom setting”. On this 2xLP set, recorded and mixed in the studio of Causa Sui’s Jonas Munk’s, the band goes even further and let’s saxophone burn into the mix. It’s a wildfire of ideas that travel far on a smoky haze of cosmic krautrock, stoner, doom, heavy psych, modal jazz and even drifts into afrobeat! Jonas Munk joins these live sessions on guitar on a few tracks as well, making up a screaming cacophony of 3 guitars, bass, drums and saxophone. Aptly titled “Another Shape of Psychedelic Music”, this is just not a record of psychedelic music. It’s also an album about psychedelic music. The very fabric of psych music seems to materialize in all its shapes and sizes and then vaporize right in front of your ears as the album burns further towards the final groove. Few bands would be able to pull this off, but Mythic Sunship maintain a down-to-earth melted vibe, even at their most ferocious. Making this album good both for zoning out as well as for pure rock catharsis. Cool stuff. Reminds me of The Stooges on Funhouse. Chaotic and cool.